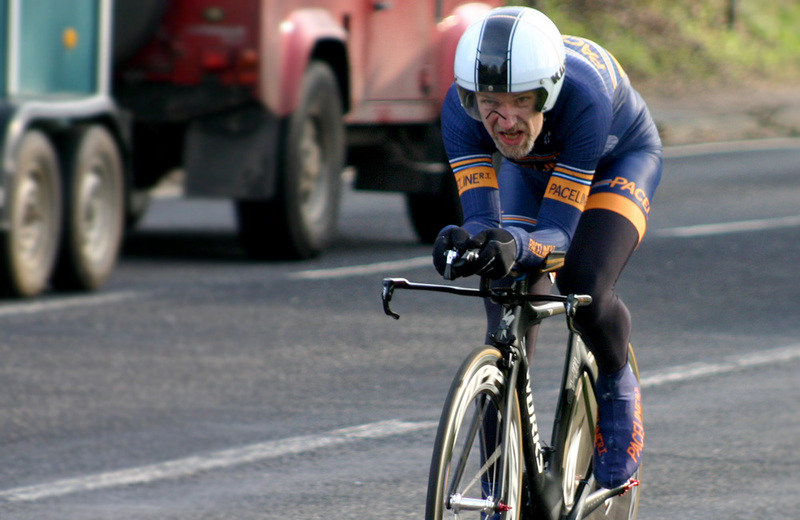 Keith Lea continued Paceline’s strong early season showing in regional TTs by taking his maiden open victory in the PMR Toachim House 25 on Sunday 13 March, following a victory in the VTTA 10 on Q10/22 the previous weekend. I didn’t have very high expectations for Sunday’s open 25, writes Keith.The startsheet included the talented riders Jonathan Parker (previously of the hosting club PMR Toachim House, but now with Team Bottrill) plus Chris Fennell. I decided that I’d be content with 3rd place. Additionally the wheels had recently fallen off my training due to bad stuff going on at home. I was actually supposed to be away on a week’s holiday with friends on the snow, but such was the domestic situation I’d had to cancel. After speaking to the organiser, I put in a late entry for this event. Q25/20 isn’t a quick course. It’s draggy. Rolling even. Nothing too steep though. The Kent courses all have an annoying rule that no turbos are to be used at the HQ, hence winter warm-ups aren’t easy. A barmy 3 degrees Celsius this morning. I managed to find a quiet spot miles away from any civilisation and turned the legs over on the rollers. I arrived at the start early enough to see Paceline teammate Tom Hampshire off, 2 minutes before my start. 3..2..1..go and it’s down to business. Clearly I wasn’t pinging. Comfortable sustainable power was down a little. This might have had something to do with the 3+ hour ride yesterday. As I said before, my training had gone off-track and I was busy trying to make up lost time. I really didn’t consider this a key event for me. By the finish line my expectations of success were even lower, with an average power of just under 270 Watts. I’d been thinking a ‘54 would be good. My Garmin declared a long ’55. Back at the HQ it was a different story. All of the solo times were up and I was clearly in the lead. Such were my low expectations that I assumed it was a mistake that would be rectified once the timekeepers had returned. In the meantime I set about the tea and cake. It did give me a chance to catch up with Jonathan Parker who said he’d not had a good ride. So I was able to definitely chalk up one of my season’s goals: an open TT win. I’d actually come first in a VTTA 10 the previous weekend, but despite being open to “all ages” it didn’t really feel like an open win. Just a short 19′ and a long 49′ to go then this season! The win also highlighted a few things. a solid winter’s training meant that all wasn’t lost despite the last month’s disruption to my routine; it may sound (very) obvious but time-trialling is about the quickest time, not the biggest power;and an unexpected win is perhaps all that bit sweeter?